Babbling Brooke: Dazzle & Chunk Cupcake Necklace Giveaway!! Necklace from Dazzle & Chunk!! The winner will be announced on Wednesday, May 12. Dazzle & Chunk to gift to one very lucky reader! Dazzle & Chunk has tons of unique, handcrafted charms for everything from necklaces to charm bracelets. At Dazzle & Chunk, variety is key. They offer a huge selection, so finding that special charm you have been looking for is never difficult. Dazzle & Chunk has 35 different cupcake charms alone! You can also create one-of-a-kind charm bracelets, custom built just for you. Now you can own a Dazzle & Chunk charm necklace of your own! One winner will receive a brand new cupcake necklace from Dazzle & Chunk. The necklace features eight rhinestones set in a pink iced cupcake charm. The delicious little treat dangles from an 16" necklace chain complete with Dazzle & Chunk heart charm. The cupcake is rhodium plated and is not hollow - this is a heavy, solid charm. visit Dazzle & Chunk and tell me what your favorite charm is. Giveaway ends at midnight EST May 8, 2010. Winner will be selected using Random.org and will be announced at Babbling Brooke. Thank you so much to Dazzle & Chunk for sponsoring this deliciously fun giveaway! I like the ladybug charm the best. These are so cute I could eat them and be in pain while it goes through my digestive track. My fave charm is the 14k gold ladybug. My fav Dazzle & Chunk charm would have to be the "Rhodium Plated Crystal Princess Crown." My fav is the Fleur De Lis with Padparadscha Swarovski Crystal charm. Hi Brooke! I love this giveaway! Please count me in! I think my favorite charm is the blue hello kitty one. You can never have too much hello kitty. Thanks in advance Brooke!!! Have a great "over the hump" day! Lovely contest Brooke and I am a sucker for adorable pink cupcakes. I follow via Google friends and my e-mail is aperturemusic@gmail.com. I do love all of the cupcakes charms but second place would be the vintage brass butterfly. What a very cute giveaway!!! Hey Brooke! I'm a follower through Google Friend Connect ("Lissi") and RSS feed. This giveaway is bad news for me. I went to the website and fell in love with every single thing there! The cutest, if I really must pick only one, is the blue flip flop. Since I practically live in flip flops here. LOL! I blogged about this giveaway on our blog (Nail Addicts Anonymous) on the sidebar! Thanks for the adorable giveaway opportunity! Brooke, this is an awesome giveaway!! As for my fav charm i would normally go for the cupcake lol but i really like the large vintage locket pendant. I couldn't pick just one! I love the palm tree and the paw print. Two of my favorite things - the beach and animals! My fav charm is the cupcake. I have also added your giveaway into my sidebar of my blog, you can see it there! I also tweeted about your Giveaway! My favorite charm is the Minnie Mouse one! So cute! I would like the silver horse charm, I'd give it to my friend Becky and tell her "I got you the pony you've been wishing for!". I love the Red Heart Fashion Purse. My favorite is the Rhodium Plated Crystal Princess Crown. Cute! I'm a follower through Google Frined Connect! My favorite is definitely the cupcake! SO adorable!!! The ladybug is my favorite! It is soooo cute! I'm a follower and I like the Green Dragonfly charm. I love the Marie Antoinette Necklace-1. I blogged about your giveaway. See my left sidebar for the cupcake photo and a link to this post. My favorite is the Vintage Sterling Silver Teapot with Black Crystal. The pink cupcake was hard to beat! My favorite, but it was hards to choose was the cake piece!!! All are way to cute!! I'm a follower!!! So many cute charms, it is hard to pick just one, but I loved the Sterling Silver Flip Flop With Swarovski Crystal. I am a follower of your blog. My fav charm is the birdcage, but I really hope I win the cupcake! OMG! Is this an international giveaway? I follow and I love their Blue Kitty With Crystal charm! I follow & my favorite charm is the 14k Gold Flirty Heart 14k Gold Flirty Heart. SO BEAUTIFUL!!! I like the bird in a cage. My favorite charm is the cute donut ! I love the sterling silver flip flop charm with crystals. I don't think my other post worked. My fave charms are the cupcake 1s & the birthstone ring charm for July. I like the Handmade Pink, Purple, and Blue Polka Dot Cupcake Necklace! I'm a follower! Musicalhouses on google friend connect. my fave is the Rhodium Plated Compact Make Up - the makeup compact is definitely me! Hello! I love the charm. 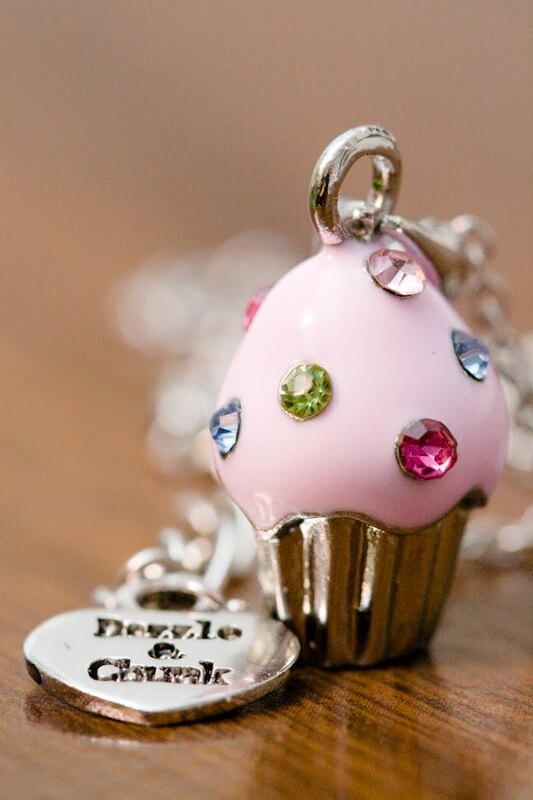 my favorite cupcake charm from dazzle&chunk is "Valentine's Cupcake" Necklace with Crystal Sprinkles. Brooke, this is such a delicious giveaway! 4) My favorite charm from Dazzle & Chunk is the Adorable Photo Necklace, "Live, Love, Laugh"
4) My blog post with pic is here. Great going, girl! More power!!! following via Blogger/Google Friends Connect! my favorite charm was the rhodium plated Sassy Pink Purse!!! I love this charm. 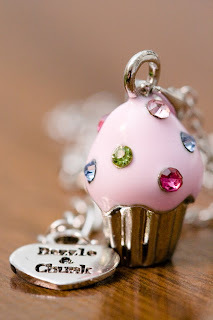 I have my own cupcake business, so this would be a wonderful charm to wear to work each day! I thought I commented already! I love the necklace that you're wearing! I love the icecream cone necklace! I tweeted about it http://twitter.com/retnoandriani. I am a new follower. I follow with google friend. I love the Ice Cream, Sterling Silver With Swarovski Crystals . I'm a follower & I loved the Purse-Sterling SIlver Red Heart Fashion Purse charm..its just so cute !! I like the Dark Pink cupcake Necklace With Gemstones! I'm following your blog. My favorite charm is the Rhodium Plated Crystal Princess Crown. Thanks! I'm a follower who would like to enter your giveaway! +1 I tweeted about this giveaway! +2 I have included it in my giveaway side bar on my blog! I'm international so I hope this counts! I'm a follower via google friend connect as "cynthia"! My favorite charm is the vintage brass butterfly! I like the Vintage Photo Frame Charm. My favorite is the Rhodium Plated Black Bikini Top. My favorite charm would probably be the dog paw print. The Hello Kitty ones are adorable too! I have posted the contest in my sidebar! I'm your follower and i so love the 1 Rhodium Plated Baby Shoe, Baby Boy charm! Follower on GFC & my favorite is the Butterfly With Rhinestones. Butterflies are my favorite! I'm a follower and my email is jenbobbtt (at) gmail dot com. Honestly, my favorite is the cupcake. I want the cupcake. It was hard to choose but I love the Rhodium Plated Pink Butterfly Charm With Crystals. I love the sterling silver fleur de lis charm! I love the sterling silver fleur de lis charm and I'm a follower. (forgot the follower status so you can delete the entry right before this one. This is the right entry.) Thanks! I follow your blog and my favourite charm is the Rhodium Plated Snow White. I follow your blog. I love the Ice Cream, Sterling Silver With Swarovski Crystals! i really like that cupcake charm, its so adorable.